I felt a sense of frustration in Bonnett’s 2003 article Following in Rabelais’ Footsteps: Immersive History and the 3D Virtual Buildings Project. Whilst he perceived the benefits of using a 3D environment to teach students to confront the issues associated with creating visualizations from an incomplete historical record, it was clear he thought the technological limitations were restricting its potential. Has access to immersive realities changed in the past decade? 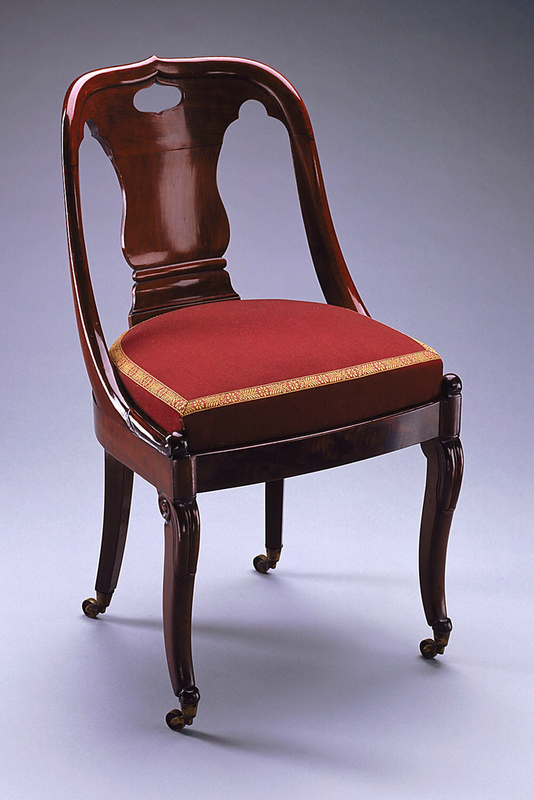 We do see them feature ever more increasingly in the museum setting but as for the classroom, I am unsure. I think once more we are faced with the question – do visualizations teach us anything new about our research, anything we do not already know? In most cases I do not think it does. But I do see potential, for example in reconstructions of ancient cities we can decipher new correlations between building and monuments that may not have been obvious before. Here I mean in terms of sight lines and settings (as researched by Elizabeth Marlowe in Ancient Rome), the connections that would have been assumed by people in the past, but are not necessarily obvious now. Of course, it takes vast resources to build an environment that would be conducive to making these discoveries, something that the digital humanities often lack. And so maybe Marlowe’s architectural drawings are an easier way of demonstrating her theory visually. There is another issues to be considered, relating to the interpretations we make during the 3D visualization process, both in computer and caved based cases. We experience virtual realities that have been created by another’s perception of a past reality, we look through their eyes, so to speak. It seems to me there are many layers of interpretation involved in creating such models – for example in reconstructing a historic building, there are interpretations made concerning the difference between the plan and the building that was actually constructed, interpretations of the gaps in the historical record and how they should be presented, interpretations made by the designers of the interface which frames our visualization and so on. As Diane Farvro mentions immersive realities necessitate the addition of “aural and kinetic” layers which will add yet another layer of interpretation. How can we hope to recreate the sound and textures of the past accurately? However despite the associated issues we push on, and I think we are right to do so. Humanists work within a society that is increasingly connected to 3D representations in advertising, gaming and film, to mention a few. An expectation has been created and the humanities must keep up. How are networks useful in the digital humanities, both at a micro (network analysis) and macro (research network) level? Many of this week’s readings attempted to address these questions. Scott Weingart cautions us to use network analysis wisely, and I think he is right. There is a tendency to jump on the new-tool-bandwagon, regardless of how useful it may be for particular types of research. However, there are many cases where network analysis can, and should, be utilised. As Manual Lima says of the visualizations on his VisualComplexity site “all projects have one trait in common: the whole is always more than the sum of its parts”. How can humanists know when it is appropriate to use network analysis? I think the only answer to this is through education, we need to be able to fully understand questions such as; what exactly is network analysis? What is the underlying theory? What are its limits? Weingart tackles this adeptly in his Demystifying Networks blog post. I found it useful that he stressed the limitations of the algorithms behind the analyses, making it clear that two different types of edges, directed and undirected cannot be represented within the same visualization meaningfully. Much of what Weingart describes would be implicitly understood in ‘real life’ but are important to consider and address in network analysis. The second idea of networks, the macro, that the digital humanities needs a defined global scholarly network is a logical one. In theory this is an excellent opportunity for the digital humanities to define itself, to organise and optimize research. If it were operating discretely this may be achievable, but in reality we know this is not the case. The humanities by its very nature is interdisciplinary, yes we may not have the ‘generalists’ of the past that Grafton mentions but we certainly engage in cross-disciplinary research (11). There also appears to be a knowledge gap that must be bridged before this would be possible, but as we see in the conversation between the philosopher and the computer scientist in Scholarsource: A Digital Infrastructure for the Humanities this can be achieved. 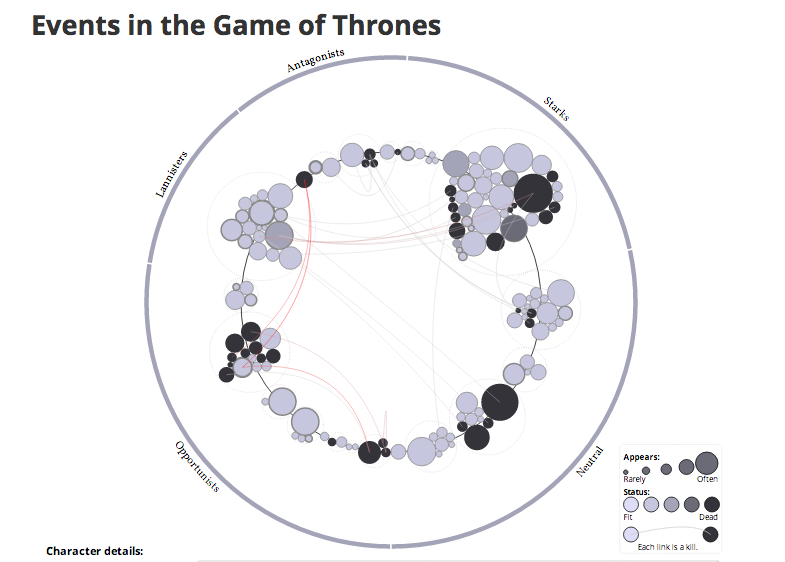 An animated network analysis of events in the Game of Thrones Book/TV Series: Useful or not? Whilst looking at some of the processes involved in actually creating a temporal visualization, I was struck by a thought; how do we think of data whilst it is in the process of being digitally visualized? What does this data mean? It tells us nothing of what the end visualization will look like as we cannot see the original data nor the software which will be used to create the visualization. However at this point it is one of three ‘parts’ needed to construct the bar graph. Does it have no value to us alone? Or can it tell us of the authors intentions and the construction of his narrative? These examples highlight the transformative steps taken to visualize data. But how does this process equate to that of traditional historical chronologies? Since last week’s class I’ve found myself thinking about two topics that we touch on in our discussion. Both are very general, but it seems to me they go to the heart of some of the issues that we need to deal with as we think about how the digital turn shapes our work in the humanities (in my case, in history). Proof. How do you prove things in history-writing? It seems a central question, but I’ve never really thought about it in such blatant terms. You make a rhetorical case, you show your evidence, you explain why the evidence makes your argument more likely than another, you give explanations for evidence that suggests otherwise, you describe alternate explanations fairly and show where they don’t fit the evidence, or work as well as your explanation… Then, you explain why this is is important, why it answers questions that historians are interested in. But it’s not quite proof. Not what passes for proof in a positivist view of science, where being able to prove something wrong is key. Digital evidence and digital manipulation seems more scientific, and therefore might lure us into positivist ideas about our work. It seems to me that that’s a false promise; we can still be just as contextual, hermeneutical, and historicist, and just as little positivist, with a new kind of evidence. Intuition. As a historian, I pride myself on historical intuition. I think I can tell when, say, something seems out of its right time; when something seems odd for its period; when an argument seems unlikely. I’ve read a good bit, looked at many artifacts, and have a feeling – an intuition – for this. But I know that sometimes I’m completely wrong. That’s how history-writing works; revisionism is important! And so, when we look at the results of a digital history project, and say, yes, that fits my intuition, that’s not a bad thing – most historical projects fit within our sense of how things were. The project does what we might call normal history – it provides more evidence for our existing model. Every so often, though, we see major changes, important revisions in our work. The last major experiment with the digital in history, the cliometric revolution of the 1980s, when economists brought their theory to history, claimed major changes in interpretation. It made many historians nervous, and indeed, sometimes, those historians’ intuitions proved correct. But not always. New kinds of data, new kinds of interpretation, new approaches; they hold out the promise that we might see exciting new revisions not only in how we think about history, how we make arguments, and how we understand change in the past; but also about particular historical stories we tell. And that would be good. Adding another thought to Massimo’s post about the ways in which the digital humanities can be transformative. It is generative not only because it is about building but also because it can be about building in the open, and not by oneself, but with others. Digital, polyvocal expression can support a genuine multiverse in which no single point of view can claim the center. It serves to make humanities research into something of a new multi-player online game with global reach and relevance. There’s no tradition of making all of your notes and primary sources available in the traditional humanities, just a very structured system of footnote references that is itself part of the argument. But digital humanities tends toward openness, as Jessop describes in the London Charter. Hello Everyone! I am Daniel Johnson and I have been working in Special Collections as Brown for about one year as the project archivist for the Gordon Hall and Grace Hoag Collection of Extremist and Dissenting Printed Propaganda. In this position I am tasked with organizing ~1600 boxes of extremist material collected by Gordon Hall and purchased by Brown. Additionally, as part of the project I will be researching and providing data on the ~35,000 organizations in this collection. I current have data on about 1600 organizations and will most likely be using this for my class project. My background is in archives and database management having spent 5 years working at The HistoryMakers African American Video Oral History Archive in Chicago before coming to Brown. Gordon Hall’s Story – What items was he collecting, when did he collect them, where are they from? What is his story and how is that represented in the collection. Extremism in Relation to American History – What types of groups existed at various points in American History. Is there a relationship between national or local trends. Extremist Groups Interrelationships – How are members and groups related to one another. Are groups created as a reaction to other groups? The Stafford reading seemed to create a dichotomy between written and visual communication, where historically visual culture “suffered from a low status.” Stafford also argues that we are entering into a visual world, but that only seems to be half right. She creates a scenario where written and visual communication are in opposition to each other, where I see them as being related to one another. A lot of the other readings whether it is Tufte, Manovich or Yau advise the readers that creating useful visualization requires some sort of a combination of written and visual components. This also seems to be reflected in the world we live in. The line between visual and written communication only seems to be getting more blurred, whether it is television (the amount of text on screen during a sporting event), art (the use of text in painting), and even more so with the internet (It is hard to find any visual online without some sort of text counter part). It occurred to me that it might not be so productive to think about text and image as opposites, but as equal parts in creating one whole.